Music is the heart and soul of any culture. And every aspect of our music today, whether classical, pop, rock, or jazz, has been influenced in some way by music that has evolved from Germany, Austria, and Switzerland, as well as from German speaking regions in Central and Eastern Europe located in the Czech Republic, Slovakia, Slovenia, Hungary, Romania, Banat, Italy and others. This music has deep roots in the folklore and traditions of its people and has had a profound impact on music history and development. Yet many musicians and non-musicians alike know little about the origins or current developments of such music. It is the goal of the Alemannia Music Foundation to educate both musicians and the general public about this music so that we can develop a better understanding of its origins and influences in our culture and achieve an appreciation for the ethnic diversities and strengths in our society. The AMF provides workshops and participatory performance opportunities to musicians throughout the Southern California area wishing to study this music. And through such performances, the AMF provides public education and appreciation for the richness and diversity of this music. The AMF also seeks to promote the study of ethnic German music by providing scholarships and grants to schools and other educational institutions, as well as supporting civic and cultural societies, clubs, and organizations who seek music education and appreciation for their members. Our educational mission is primarily fulfilled through the activities of The German-American Brass Band of So. California, which is the main performing activity of the Alemannia Music Foundation. It is an ensemble of over 20 musicians from varied ethnic and musical backgrounds. Its musicians come from all over the Southern California area with various musical experiences, from high school students to professional musicians. The band maintains an extensive library of authentic European regional music and it supports music education and appreciation by giving the participating musicians the opportunity to study this music and perform the music as an ensemble. The band supports public education by performing for the public at events sponsored by civic and cultural organizations. 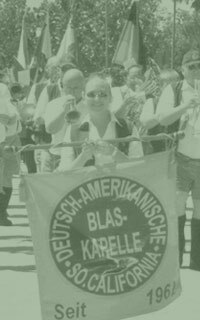 Also known as Die Deutsch-Amerikanische Blaskapelle von Süd Kalifornien, the band was founded in 1962 by Mr. Hans Schmelzer. The band has long been a favorite at numerous ethnic festivals, including the annual German Day sponsored by the German-American League and the annual Oktoberfest sponsored by the Montrose-Verdugo Chamber of Commerce. The band also received international recognition as a featured band at the Athletes Village during the 1984 Olympics held in Los Angeles. The AMF is a recognized 501(c)(3) non-profit educational organization which is supported by donations from private individuals and organizations such as the Montrose-Verdugo Chamber of Commerce, Old World Restaurant, the Danube-Swabian Association, the German-American League, and others. The AMF is an active member of the German-American League and supports member events and activities.